Third Grade Division - Videos make learning division easy. These Math division videos are great to use on phones and tablets. Our children do. I have put all twelve division videos on this page and I have closed up any outbound links. Scroll down to see all twelve with some ideas for long division at the end. Teaching third grade division is so much easier when your kids can review the division facts on their own. Most children find the ones, twos, and fives easy for second grade division. They "get" the idea immediately. On the easy side I've seen children who knew their multiplication table learn the division table in one day and seldom have I seen it take longer than 3 weeks - that's if they already knew their multiplication. Most children can learn division within a month with regular practice and flash card quizzes 2-4 times per week. Keeping the atmosphere light and fast saves time and gives encouragement. Really, just a few quick minutes works easier than long periods of time. One of the best teachers that my children had had in school would spend two days a week quizzing each of the children in the class with flashcards. They took turns while the other children were working in their Math books. Most of the children class moved through all four Math operations that very year. The rest of the week they'd copy the equations three times each for homework getting ready for the flashcard quiz. We have worksheets for this on our division worksheets page. I like to be sure that my kids are familiar with at least the multiplication concept before starting to teach division. Multiplication and division can be learned together, but I find it best if at least the first few of the multiplication tables are learned before tackling the division tables. Once they're handy with the twos and the threes you can add in the idea of dividing. Multiplication is the foundation for division so one must be familiar with the idea of multiplication before he can proceed with division. Division itself is also the foundation for fractions and decimals. As I said above, it's all easier if the children know their multiplication facts by heart first. Never spill the Math flash cards with our division videos. Bookmark them on a phone or tablet for your children to practice while riding in the car. Then have your students write the Math facts three times each to practice on our free printable division worksheets and flash cards from the ones through the twelves. There are dozens of worksheets with over six different layouts. These are so simple for children to use for practicing the third grade division facts. This video helps teach dividing by two. Usually the twos are easy to learn because the children have been skip counting and multiplying by two. It's a help when they know the concept of even numbers, too. The twos are like addition or subtraction of doubles which some children really like. If the children need more practice, simply wait a while and review again. Three times each two or three times a day is plenty. If your student/s are having problems with the division facts, or simply need to "catch up" or review, these videos can be a life saver! Hand them the phone or a tablet and press play. Seldom have I seen it take longer than 3 weeks with regular practice and flash card quizzes 4 times per week for children to learn the threes division table. Remember to keep the atmosphere light and fast. Regular practice is key and third grade division videos make this easy. Sometimes third grade division class is the first time children have to memorize the threes, yet remind them that they know the facts already if they can skip count by three. Learning division often reinforces the multiplication facts, it's just a different way of looking at the same numbers since division is the inverse operation of multiplication. Division "un-does" multiplication. Remember all the tricks you used when teaching the fours multiplication table. They can be used here now. Why are the fives so easy? Maybe it's because there are five fingers on each hand. Maybe it's because we use the clock all day long. Skip count up by five and practice skip counting down by five. A clock can be a great aid, since the minute hand points to the answer. This is super fun for second and third grade division. The tens are so easy to divide. Show the kids that the 0 disappears in the answer. It's super easy to remember and fun to practice. By the time children are this far with the division tables, they already know most of what they need to learn. The elevens are easy to recognize up through one hundred ten, so there are only two division problems left to memorize! Be sure to point this out and to note that there is only one more table with the twelves. Otherwise they have practiced all the division problems already. This is exciting news, especially when you point out that there is only one more division equation left to learn! Again, here are our division printables. Remember dozens here. They help kids visualize the twelves division table. Even sorting piles of beans or pennies into twelves can help them think of dividing a large group into twelves. If your kids can skip count by 12 for counting dozens, they can reverse it for dividing by twelve. If your kids are this far learning the division third grade division facts, they are almost finished. Congratulations! Congratulations to all of you! I remember when our youngest had gotten this far. What a moment! The twelves are very easy if the rest of the tables have already been memorized, there's only one more division problem left to memorize. My favorite advice to friends teaching long division is to be certain to give plenty of practice problems that are simple to answer. 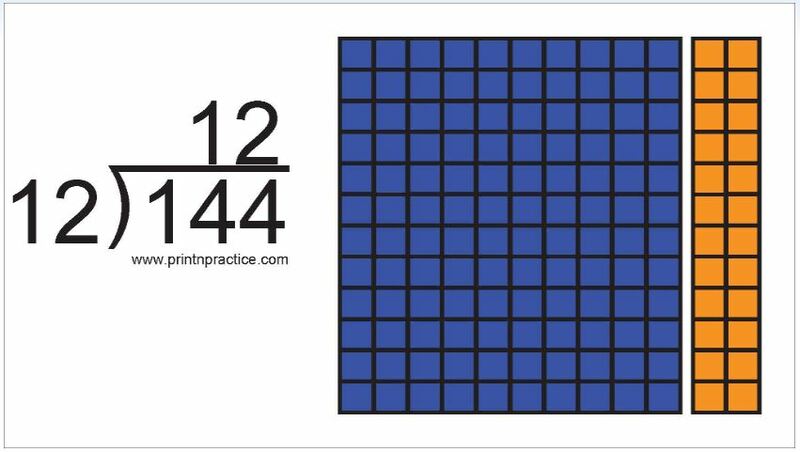 This begins, basically, as division with two digit answers and builds a habit of using the division pattern. The more the better. The even numbers are a dead give-away if you choose to start a beginner dividing by twos, but some beginners need that clue and it helps reinforce the multiplication and the use of columns when figuring on paper. The fives are easy, too. If you're working to build confidence use the twos and the fives. A next level up from the twos and fives being easy starter equations is to use multiples of ten. The numbers can form longer division problems and still be easy to see at a glance when there will be a remainder or if the number is evenly divisible by ten. They're also easy for beginners who are just learning to divide by two digit numbers. Again, if you're inventing equations, these are easy to figure ahead of your student when you're "on the spot" for a practice equation. The threes are a bit harder to see since a multiple of three can end with any of the ten digits, so they can also give a bit higher level of practice for the beginner. If you're making up your own equations at the start of teaching long division or when you're working to remedy a student's division skills, remember to add the digits in a number to see if the total is divisible by three so it's easier to use longer numbers that are divisible by three. Remember to bookmark our third grade division videos for quick practice moments. I do. Second and Third Grade Division Worksheets and Flash Cards - Print our practice division worksheets and flash cards when you're teaching the division facts. The hands on effect really boosts ability to remember. Remember that the multiplication table is also the division table, just read it from the inside out to see the division problems.